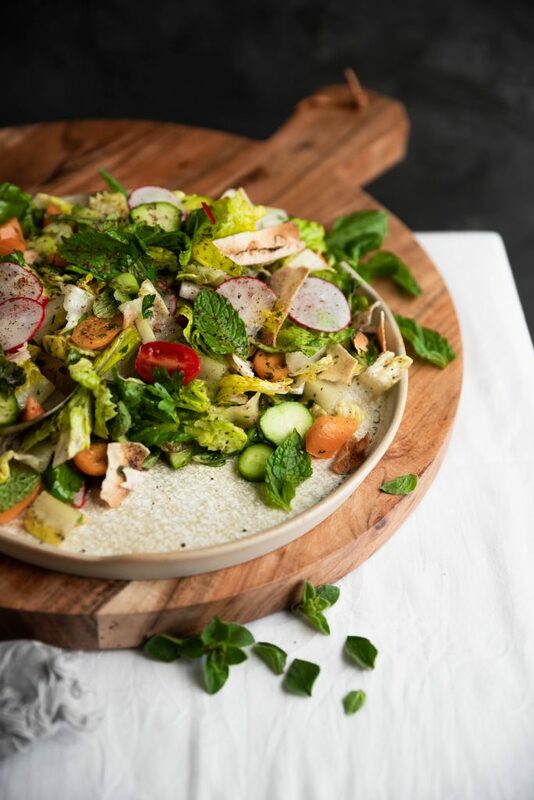 Fattoush salad is a blend of greens, veggies and a lemony sumac dressing mixed with toasted pita bread. I love salad, I truly do but when you pair salad with bread, it’s a combination that can’t be beat! 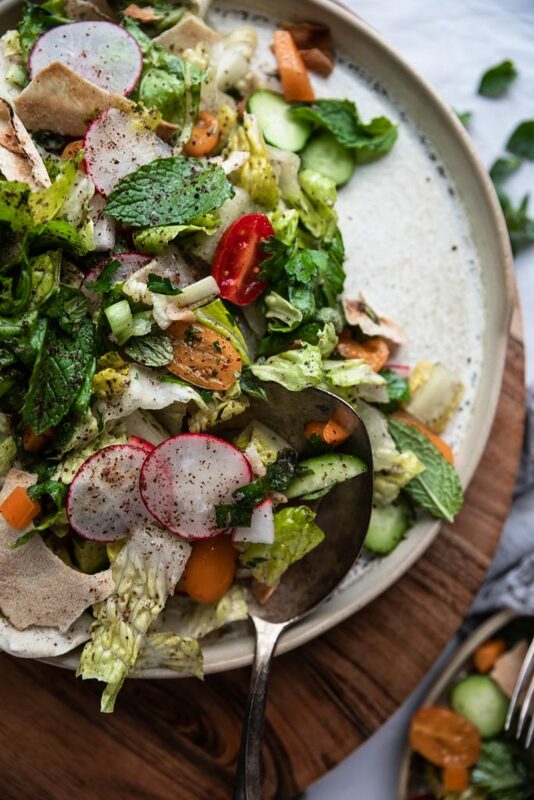 We grew up eating this delicious salad, Fattoush. Spiced with sumac spice, crunchy bread and crunchy fresh vegetables it’s almost a meal on it’s own. 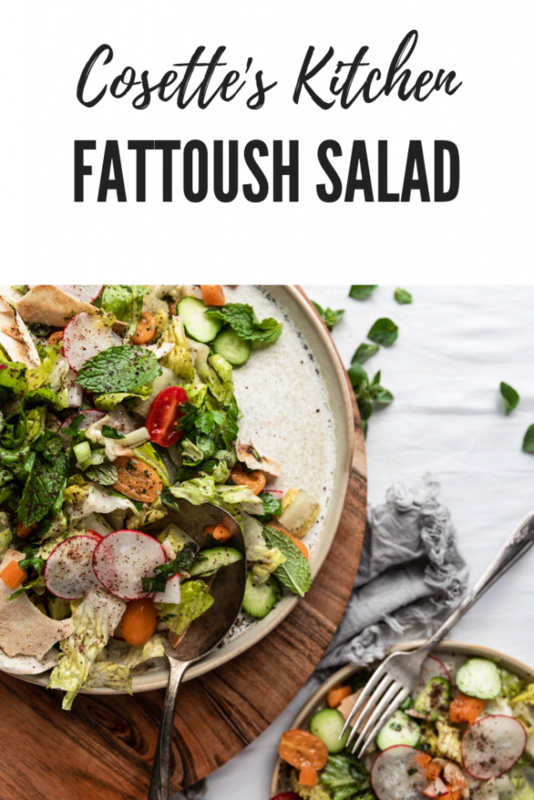 Fattoush has many variations throughout the Middle East, this version is one my family makes. One rule though, you get to eat it with your HANDS! Yes, those crunchy pita bread bits make it hard to fork, so dig in and use those clean fingertips to pickup every delicious bite of toasted pita, lettuce, radish, cucumbers and peppers. Lovely bits of red sumac coat each vegetable. While it’s best to eat the salad as soon as you mix the bread in, I have a few tricks for you to prepare ahead and have ready to go when you want to enjoy. 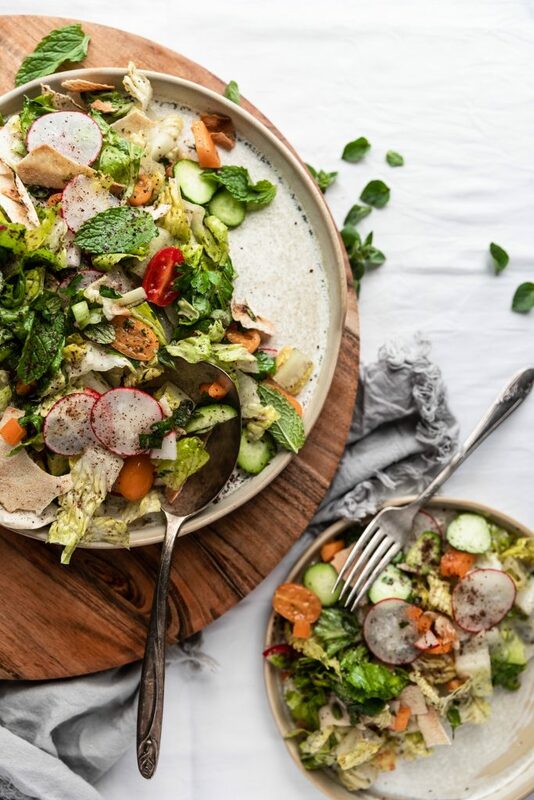 Fattoush is wonderful served with a large family dinner. The first step is creating your dressing at the bottom of your bowl, once that is ready, layer your veggies starting with your lettuce then add everything else on top and finally top with your crunchy pita bread pieces. When you are ready to eat, mix to ensure each bite is coated with the delicious lemony sumac. The bits of red sumac really make this salad so beautiful and special. Feel free to sub in any veggies you like or opt any out you don’t enjoy. It truly is versatile and perfect for a crowd! Check out this simple recipe and add it to your next dinner! As always, I love seeing your creations, tag me on Instagram or Facebook!! Don’t forget to Pin the recipe! In a large bowl, using a mortar, smash your garlic until finely minced. Add in your sumac, oil, salt and lemon juice, whisk. Add in your chopped romaine lettuce, begin layering your other chopped veggies. Finally add in your toasted pita bread. Place thin pieces of pita in your oven to broil until golden brown, remove and break into small pieces. Add to top of salad. Once ready to eat, mix to incorporate dressing. Enjoy! This looks fantastic! As summer gets close, I’m on the lookout for salads such as these! Thanks for the recipe, I’ll be making this soon! I’m so glad to hear that, yes, a perfect summer salad! !